Blueberries, Art and Life: Cherries..... and blueberries! Cherries, Watercolor. Original size: 9 x 6, now bookmark sized. If there's one thing I learned from this little piece, it's the importance of shadows. There I was, merrily painting away, thinking that, hey, things were going fairly well (you know what they say about pride going before a fall) when I got to the shadows. So diligent was I about new techniques I was trying that I really hadn't given much thought to the shadows. Mistake Number One. They weren't neat shadows with clean edges that were easy to draw and paint. They were sort of there, and yet they really weren't there. So I decided I wouldn't worry about the shadows, I'd work on those yummy red cherries and just wing it when I got to the shadows. Mistake Number Two. You're going to cringe when you read this next part. Not sure I should actually admit to this... but, in the spirit of learning, here goes. For the shadows, I loaded up what I thought was a rich dark color, quite suitable for shadows, and then just dropped in this strong color with no particular aim or plan. I know, I know.... Mistake Number Three. 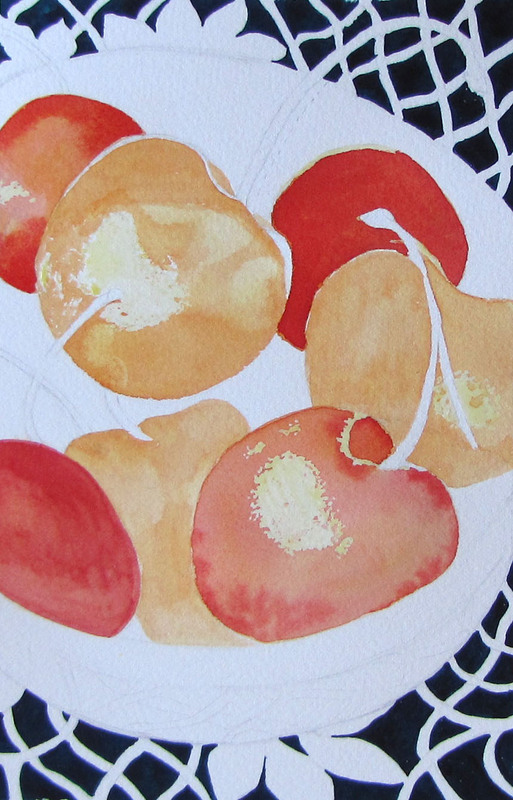 I guess I thought the paint knew where it was supposed to go, and, like well behaved paint, would produce wonderful shadows to make those cherries pop! I laugh now - even as I'm typing this - thinking about my blissful ignorance and audacity. 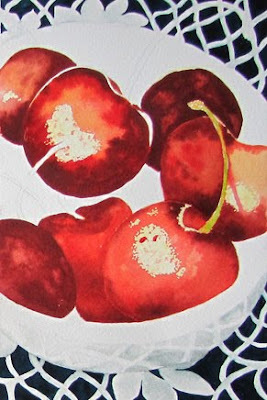 As you can see, I got exactly what I deserved for giving those all-important shadows short shrift.... a misshapen lump of some dark thing that's creeping up on the cherries. As I looked at the mess I'd made (and thought about how much time I had in this one little painting) I remembered something Jo once said (Bless you, Jo! ), "Why not cut out the part you like and make a book mark"? A Ha! A bookmark it is! So, the final, much narrower version is now a one-of-a-kind bookmark. Which, appropriately, I shall use while I'm doing some studying on shadows and light. I now have a new found respect for shadows. Aside from the shadow fiasco, I was okay with the lace and the reflections on the side of the bowl... my first time tackling that kind of subject. I'm usually not big on still lifes, but I really enjoyed doing this one. 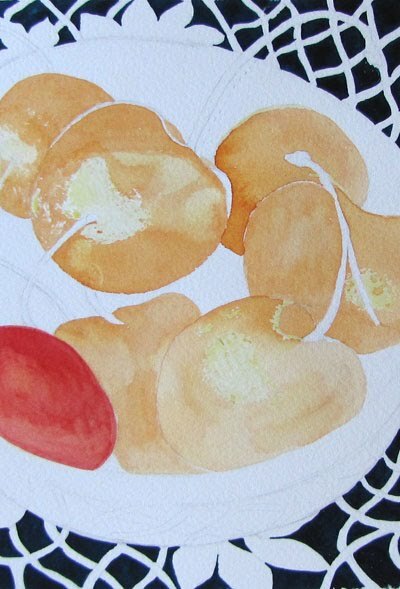 (BTW: the yellow cast on the highlights in the first 3 photos is masking fluid). Beautiful cherries, and beautiful words to read! Thanks! Hi Teresa!.... What a unique use for this unusual format! Light and shadow combine to create such a powerful force in a work. Add a dash of rich colour... as "You" know how to... and you have a ... Gem! You certainly have some amazing talent! I certainly appreciate your kind words about my husband being deployed. We will certainly pray for your son-in-law...no matter the branch or deployment, its always hard! Take care! I have to smile along with you but I do know the frustration. The cherry bookmark looks wonderful so realistic. Something good always comes out of bad. LOL Now you have the best bookmark ever. Hope you laminate it and keep it for ever.. It will always remind you about the importance of shadows. 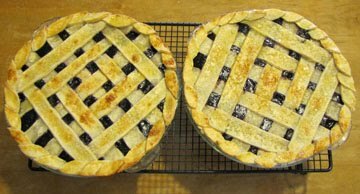 Your work is always great and perfect as is your wonderful Blueberry pies. Yummy. Oh my! such delicious looking cherries! You did a lovely job on the lace and shadows on the bowl. I hope you enjoy the bookmark. They make nice gifts, too. I like the cherries that you've posted, and it is fun to see the steps along the way. As for the blueberry pies.... now those would be so much better tasted in real life! I can't believe the volume that you've picked this year. Fantastic!! There are times you love one particular part of a painting more - and what a novel idea to make it a bookmark. You now have the most stunning bookmark I have ever seen! You know what. I think how you cropped the image in the end was 100% the best decision, regardless of how happy you were with the shadows. It makes the composition tight and sharp. Have you tried working into shadows ? Arm yourself with a good fine nylon brush, dampen it, and you can lift parts of the wash up and work into the shadow to bring it back to where you want it. But you don't need to here 'cos that end result is a corker. And can I have a slice of pie please ? 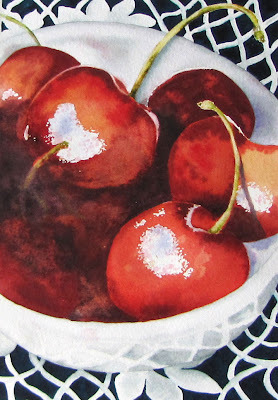 What a wonderful way of making "lemonade" from your cherries painting! You illustrate wonderfully why I rarely paint in watercolor though. Somehow, I just can't get my mind around everything that needs to be planned ahead! You've done so much better than I ever would so hope you aren't beating yourself up over this painting! It really came out beautifully. I couldn't even comment on the pies - my mouth was watering so much that it dripped on the computer keys and my fingers kept slipping off! Maybe you could do a whole series of watercolors in that format and frame them together? The lace and where it is reflected into the bowl is awesome! And those cherries look good enough to eat! Of course those pies...yum! Hmmm, yes, watercolor is a......tough....teacher. No holds barred! However, your save was every bit as important (not to mention good) as the lesson! Teresa, it is a beautiful piece, especially with water color, it is tough going with shadows, but I liked how you were proceeding. Cropping the best part was a wise decision, and using it as a book mark is wonderful, but you could have tried lifting up some color for the 2 cherries that merged in tot he shadows, overall, a nice post and a reminder while working with shadows, thanks for sharing! Great save, Teresa! Your cherries look delicious, and the pies!! Incredible. Are you going to paint the pies, too? They'd make a good subject. That is how I'm operating! I had to laugh, I think the paint is suppose to go where it belongs! What it doesn't? I love the cherries, a bookmark is a great idea! Man! Your blueberry pies have my mouth watering!! Sending some Bengay your way! Now how I wished I could paint watercolours like that. I agree with everything Bruce Sherman said. You are really close to a great painting. You and Jo are very clever. I never thought of bookmarks before. I'm the queen of scrubbing out and it's not always successful:) The cherries are lovely. I could go for dessert now, and those pies look yummy! A piece of blueberry pie and an ice cold glass of milk, please. I thought I was looking at a real bowl of cherries at first! Now that would be a bookmark to treasure. The lace is very beautiful too! The cropped painting is a gem, and wasted as a bookmark. Frame it! That darn paint - it just won't obey sometimes, will it??? I do like your "save" of turning it into a bookmark - that'll teach it! - if it doesn't behave, it gets lopped off!!! Mine usually get banished to the closet until it can behave better. Flowers, cherries, butterflies! Gosh, you are an amazing Artist Teresa. Thank you for your lessons and your art.